*Optional boom extensions 4,6 m (15 ft) fixed swingaway extension. Maximum tip height: 23,1 m (76 ft) 4,6 m - 7,6 m (15 ft - 25 ft) telescopic swingaway extension. Maximum tip height: 26,2 m (86 ft) Both extensions can be offset 0°, -15°, and -30° via pivoting boom nose. Boom nose Two sheave, quick reeve type with three- pinned pivoting (0°, +40°, and +80°) design to minimize head space requirements. Lowers head height 40,5 cm (1.33 ft) when nose is pivoted fully forward. Anti-two block device Standard anti-two block device (hard wired), which, when activated, provides an audible and visual warning to the operator and "locks out" all functions whose movement can cause two-blocking. Rated Capacity Indicator (RCI) Black and white, graphical display of boom angle, boom length, boom radius, rated load, and calculated load. Allows for operator inputs to set the crane configuration. RCI system is hardwired and calculates load via pressure transducers in the lift cylinder. Display includes a color coded light bar and audible alarm with function cut-out if load exceeds the load chart parameters. *Optional RCI system includes a full color graphical display, work area definition (WADS), and a datalogger. Hydraulic system One pressure compensated variable displacement axial piston pump, with load sensing. Maximum output of: 155 LPM (41.0 GPM) Maximum operating pressure: 276 bars (4000 p.s.i.) Six-section valve bank, chassis mounted, operated via dash mounted pilot pressure hydraulic joystick controllers. 151,4 L (40 gal) steel hydraulic reservoir with sight level gauge and steel side plating to guard against side impact. Return line replaceable filter with by-pass protection and service indicator. Cartridge filter rating of three micron. Chassis High strength alloy frame constructed with integral outrigger housings; front and rear lifting, tie-down, and towing lugs. 6.2 m2 (66.3 ft2) carrydeck size with 9072 kg (20,000 lb) deck only carrying capacity. Deck coated with anti-skid treatment. Outriggers Single stage hydraulic telescoping beam with oblique style jack cylinder on all four corners. Provides extended and down and retracted and down lifting capabilities. Integral holding valve on both beam and jack. Outrigger positioning indicator located in dash display. Outrigger pad size: 222 mm x 254 mm (8.75 in x 10 in) Maximum outrigger pad load: 15 876 kg (35,000 lb). Outrigger controls Independent outrigger control rocker switches for beam or jack selection with a separate extend /retract rocker selector switch. 360° level bubble located inside cab. Engine (Tier III) Cummins QSB 3.3L four cylinder / turbo-charged diesel rated at 74 kW (99 hp) at 2600 r.p.m. Includes std. 120V engine block heater and air intake "Grid" heater. Engine hourmeter located in dash display. Alternator: 90 amp. Maximum Torque: 415 Nm (306 ft/lb). NOTE: Required for sale outside of North America and European Union countries. Fuel tank capacity Steel with side impact plate. Capacity: 151,4L (40 gal). Transmission Powershift with four speeds forward and four reverse. Steering column mounted shifter. 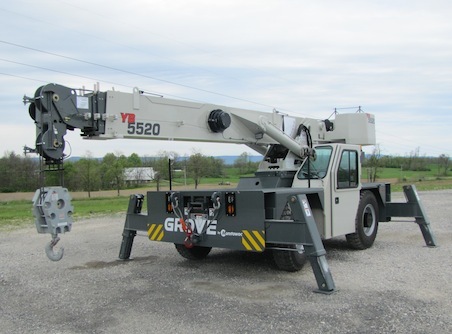 Operators control station Frame mounted, open air style control station with cab shell includes all crane functions and driving controls and equipped with overhead safety glass. Other standard equipment includes a suspension seat with seat belt, sight level bubble and 1,1 kg (2.5 lb) fire extinguisher, and tilt steering wheel. The dash panel will display the fuel level gauge, water temperature gauge, engine r.p.m., battery voltage, and hour meter. Indicator lights will display parking brake, low transmission pressure, low brake pressure, outrigger position, headlights, work lights (if ordered), and hoist 3rd wrap (if ordered). Crane function indicator and turn signal indicators are also included. The load indicator display will be mounted on the top of the dash panel for direct line of sight for the operator. *Operators control station enclosed Includes the standard cab shell and all controls and indicators noted above, with the addition of front, rear, and right side glass, a split (two-piece) hinged door with sliding glass, front windshield wiper and washer, hot water heater and defroster with fan and cab dome light. Electrical system One heavy duty maintenance free 12V battery, 820CCA at 0°F. Drive Two-wheel (front-wheel) as standard with four-wheel drive as an option. Drive axles supplied with planetary hubs and limited slip differential. Suspension/axles Front: Drive / steer in both two-wheel drive and four-wheel drive Rear: non-drive with steer in two-wheel drive, drive/ steer in four-wheel drive. Front axle is rigid mounted to frame. Rear axle offers 1.5° of oscillation. Brakes Hydraulic actuated internal wet-disc service brake acting on each drive wheel. Dash mounted rocker switch with indicator light for activating or release of the dry disc parking brake mounted on the transmission output yoke. Lights Full LED lighting includes turn indicators, head, tail, brake, and hazard warning lights recessed mounted. Miscellaneous standard equipment 18 t (20 USt) two-sheave low profile "galvanize coated" hook block with "quick reeve design", back-up motion alarm, outrigger motion alarm, no-skid decking, front and rear lifting, towing, and tie-down lugs.